Manufacturers, importers of Earth moving machinery and derivative machinery designed and constructed to the standard EN 474-1:2006 +A4:2013. Action to be taken by all manufacturers which supply relevant product to the UK market should ensure compliance with the Machinery Directive 2006/42/EC in respect of visibility from machines, in the temporary absence of an applicable transposed harmonised standard. On 28 January 2015, a warning published in the Official Journal (OJ) of the European Commission came into effect removing the presumption of conformity from EN 474-1:2006 +A4:2013 Earth Moving Machinery – Safety – General Requirements in respect of visibility. This means that compliance with this standard will no longer automatically assure compliance with the Essential Health and Safety Requirements (EHSRs) of the Machinery Directive 2006/42/EC, particularly EHSR 3.2.1. Driving Position, concerning visibility from the operator’s position. Clause 5.8 of BS EN 474-1:2006 +A4:2013 makes a normative reference to ISO 5006:2006 Earth Moving Machinery – Operator’s Field of View – Test Method and Performance Criteria. Prior to the publication of the warning this conferred a presumption of conformity with the Machinery Directive. ISO 5006:2006 does not fully reflect the state of the art; i.e.it does not fully reflect the possibilities offered by modern visibility aids and systems. Both CEN and ISO are in the process of amending both standards to reinstate the presumption of conformity of EN474 – 1 with the Machinery Directive. Manufacturers and importers of Earth Moving Machinery within the scope of EN 474-1 should review the conformity assessment of their product ranges in respect of visibility from the operator’s position to ensure continued compliance. Where necessary they should then implement improvements to affected products. The review of the conformity assessment can be undertaken directly with the Machinery Directive 2006/42/EC, in particular EHSRs 3.2.1. Operator’s Position, 1.1.2 (b) Principles of Safety Integration, and 1.7.4.2 (l) Contents of Instructions, and fully consider the state of the art. Manufacturers may wish to work towards the recommendations proposed in the amended standards, as they are developed, as part of their conformity assessment. The provision of information on residual risk. A visibility map is considered a suitable approach. (see Appendix 1). HSE recognises that the design of many current models of Earth Moving Machinery are driven by the requirements of ISO 5006, and that it may not be possible to respond to a step change in requirements immediately. Where this is the case, manufacturers should work towards the implementation of necessary changes to the design and user instructions using a risk assessment approach. This is likely to address machines with significant maskings, (blind spots) for example, when reversing. Where design improvements cannot be made in the short term, then manufacturers should revise their instructions to inform users of residual risk (see Appendix 1). The Machinery Directive makes it clear that market surveillance authorities such as HSE must presume that products are compliant unless they have good reason to believe otherwise. However, HSE may request copies of manufacturer’s Technical Files and may also undertake market surveillance activities. HSE may take enforcement action against manufacturers and suppliers where products are demonstrably unsafe, or require improvement of non-conforming products. Reliance cannot be placed solely on equipment fully meeting EHSRs. The law requires operators/users of this type of equipment to undertake suitable and sufficient risk assessments to determine how the machinery should be used safely. Operators/users may fit additional visibility aids (e.g. CCTV) to a machine if it is identified that these are needed through the risk assessment process. Where earth moving machinery has been properly assessed, the job suitably planned and safe systems of work introduced (pedestrian segregation, etc), then it should be possible to operate the plant safely, despite the withdrawal of the presumption of conformity. Operators of such equipment can find useful advice on the safe use of plant and machinery on the HSE website at Workplace transport and Construction - Safety topics - Mobile plant. (i) EHSR 1.1.2 (b) requires that "In selecting the most appropriate methods, the manufacturer or his authorised representative must… …inform users of the residual risks due to any shortcomings of the protective measures adopted…". EHSR 1.7.2 requires that "Where risks remain despite the inherent safe design measures, safeguarding and complementary protective measures adopted, the necessary warnings, including warning devices, must be provided." EHSR 1.7.4.2 (l) requires that contents of the instructions provide "…information about the residual risks that remain despite the inherent safe design measures, safeguarding and complementary protective measures adopted"
HSE expects that manufacturers will follow the normal iterative design process outlined in the BS EN 12100 series of standards to eliminate, reduce and mitigate against risks, including those related to movement of vehicles and visibility, to the lowest level which is reasonably practicable. Information on residual risk must be effectively communicated to those who purchase equipment. 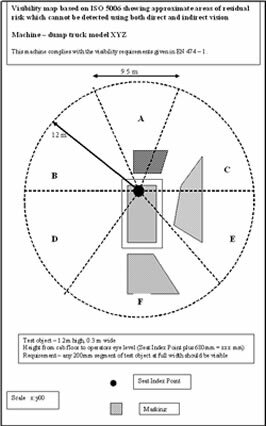 HSE believes that an effective way to meet the EHSRs is to provide those who purchase machinery with a diagram or visibility map illustrating the significant maskings (blind spots) around the Earth Moving Machine. Manufacturers may choose an alternative but equally effective route to communicate residual risk. 1. The map should show approximate maskings (blindspots) between the 1m rectangular boundary and the 12 m circular boundary as shown in ISO 5006:2006. For larger machines (those machines where there are no specified performance requirements stipulated in the standard) the circular boundary should extend to 24 m.
2. The map should represent the base machine in the travel position with attachments as sold. It should not include the improved visibility performance produced using additional aids which are optional. The manufacturer may wish to supply enhanced visibility maps showing the reduction in blindspots where additional aids are provided. For machines sold without attachments then a visibility map should be provided for the largest attachment recommended by the manufacturer which restricts operator visibility to the greatest extent. The height and width of the test object used, it is recommended that this should be standardised at a height = 1.2 m, width = 0.3 m representing a person crouching. A statement indicating that the map is an approximation to act as a guide to operators who may wish to improve visibility using additional aids. The map provides an approximate indication of what can be seen by an operator seated in the cab wearing appropriate seat restraints. A statement indicating the map does not represent the visibility requirements stipulated in EN 474 – 1. The visibility map should be included in the operators manual.